Bretons do not like to consider themselves part of France, much like the Welsh and Scottish relationship with the English (but more so). When driving out of Brittany to the east, it is common to see the department sign obliterated with graffiti, declaring that you are now entering France rather than Normandy. The coast is spectacularly jagged and rocky, much like Cornwall. The huge tidal range of the north coast makes it particularly striking (watch out for the trivial pursuit question asking which port has the largest tidal range in Europe - it's St-Malo). Many guidebooks talk about the Pink Granite coast being one of the most spectacular in the world. I wouldn't argue. It is incredible that it has not been destroyed with over development. Look at any attractive part of the English coastline and more often than not there will be greasy cafes and amusement arcades a stones throw away. Not so in Brittany. Miles of beautiful beaches, impressive cliffs and no tat at all (or at most, a tiny bit in the recognised seaside resorts). Every time I go to Brittany (I go there a lot - as often as I can) I find something new about the place that makes me like it even more. One year in early August I went to visit my father, who resides semi-permanently in Dinan. He has a modest terraced house on a cobbled street very close to the centre of the town. As it was his 75th birthday we were looking for a special place to take him for a meal. We read in a (generally very good) guidebook, that a posh restaurant had been set up in the top of an old water tower, in Ploubalay, not far from Dinan. Restaurant du Château d'Eau promised excellent seafood and a wonderful view of the coast. On our way back from Cap Frehel and the wonderful La Latte Fort (see picture below) we decided to pop in to the water tower restaurant, to check the place out. After our short journey up in the lift we found ourselves in a rather ordinary bar/café - it seems the posh restaurant had come and gone. On the plus side the view was still there. We stayed for an ice cream and a quick coffee, and then took a walk round the terrace, admiring the view all the way. Later in evening we enjoyed our meal down at the port in Dinan, discussing Cap Frehel and the tower. The consensus of opinion was that the water tower is worth a visit - but possibly not for the food! Unless you have limitless time (and funds) to visit all the areas of France, a guidebook can be an excellent way of deciding on a region before arranging visits to view property. Whether you are buying for your main home, or to rent out, the attractions of an area are important. However beautiful your little cottage is, if there is little to do for miles around (Brittany is a big place), you are either likely to get bored, or struggle to find people to rent it from you. The Hachette Vacances guidebook is great for its practical style. The sections are short and punchy. 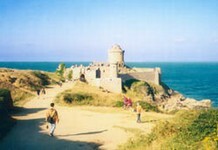 It breaks Brittany up into small chunks and picks out the very best things to do and see in each area. It is the book to use to plan your Brittany holiday, infact the best I have found. (I help organise a trip to Brittany every Mayday bank holiday for a group of twelve friends. This book helps me look like the expert guide!) For me, many other books either over do the history, or are more suited for the coffee table. This one has good maps, great photos and lots of information. The publishers have even negotiated discounts on entry fees to many of the places mentioned. Overall, it is excellent value for money. David Frere-Smith is Managing Director of French Property Links and owns a property in the Côtes-d'Armor department of Brittany.